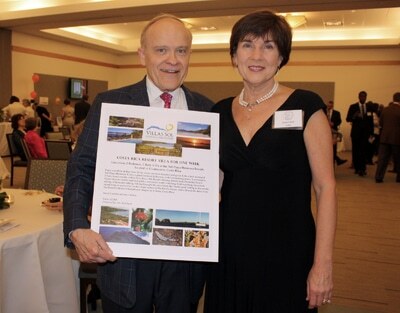 Howard and Janet Clark with the winning bid on a live auction item! Join us for the 2018 Vintage Affair! Click here to purchase Vintage Affair tickets. The Vintage Affair is CAC’s largest annual fundraiser. The Vintage Affair brings together top local restaurants, fine wines, music and fun live and silent auctions. From the 1st Annual Vintage Affair held at the historic Glenridge Hall in 2003, the benefit has grown in prestige and name recognition as one of the most anticipated charity events in town. Over the years guests have enjoyed different themed Vintage Affairs such as Country Chic, Silver Celebration and Totally Georgia. All of the food, wine and auction items as well as the manpower to plan and organize the event are all donated by generous businesses, sponsors and volunteers allowing almost every dollar raised to go to CAC. For information on business sponsorships, in-kind donations and volunteer opportunities contact the Vintage Affair chairwoman Toshia Battle at mylynda36@hotmail.com.